Over the past 80 years, our strong manufacturing expertise and rigorous testing delivers durability and quality service you rely on. Moving forward Hendrickson Defense will continue to invest in most advanced testing and validation tools. Hendrickson Defense uses the most advanced engineering software to model specific components. Strong manufacturing expertise along with rigorous testing and analysis techniques. Across the globe, Hendrickson is known as a proven manufacturer of reliable, heavy-duty suspensions that feature best-in-class ride and handling characteristics for severe military and commercial applications. Our legacy embodies nearly 80 years as the leading innovator and manufacturer of suspension systems and components for the global heavy-duty vehicle industry. Hendrickson products are designed and developed to meet stringent durability requirements and outpace the competition in regards to performance, maneuverability and quality. The robust, technologically-advanced systems designed by our engineers have been proven time and time again to excel in harsh environments. 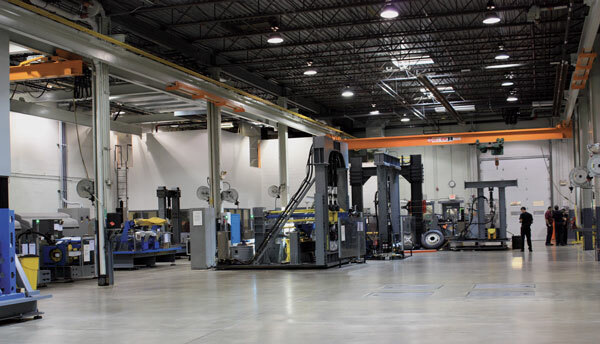 In addition, our technical expertise allows us the ability to partner with customers on rapid vehicle integration projects and customization for specific applications. Over the past century, Hendrickson has built a strong reputation for reliable, durable products, and it is precisely this reputation that drives us to continually exceed the expectations of our customers. In 1926, Hendrickson introduced our first walking-beam suspension, a concept that is still widely used in commercial vehicle and defense applications today. Since that time, we have continued to drive the industry with breakthrough suspension designs, manufacturing strength and rigorous testing and analysis techniques. Hendrickson uses advanced engineering software to model specific components, identify stress points and simulate suspension performance in different terrain and load conditions. In addition, our sophisticated in-house research and development facility houses numerous test rigs designed to simulate real-world scenarios. This allows Hendrickson to achieve rapid development and increase truck manufacturers' speed to market on time-sensitive government projects, while still maintaining the quality and reliability that are synonymous with Hendrickson products. Through our dedication to rigorous testing and validation, our goal remains the same - to provide the most technologically advanced and robust products available. Our strong manufacturing expertise and rigorous testing delivers durability and quality service you rely on. Hendrickson Defense is a leading manufacturer and supplier of premium defense suspension components to global markets.